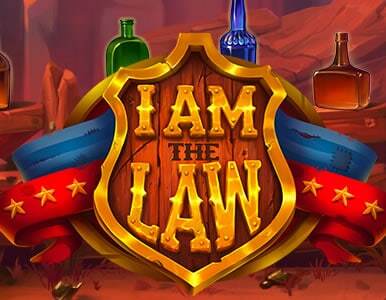 Play sharp-shooting sheriff in a wild west town in I Am The Law, a 5 reel, 25 payline slot from 1×2 Gaming. This outlaw adventure comes with expanding wilds, a pick me bonus and a feature round that awards 10 free spins. Play on all devices from between 25p and £100 per spin. The design in I Am The Law is really rather good. The setting is the Main Street of a dusty Wild West town. With wooden buildings and a saloon in the background, you’ll see a selection of classic cowboy imagery spinning around the reels. Joining the stylised A to J royals are bottles of bourbon, pistols and poker hands, shotguns, horses and a stagecoach. The saddle bag full of gold is the top standard symbol. Land 3, 4 or 5 of these and you’ll receive a payout of 2, 14 or 40 times your stake. The flame-haired woman sheriff is the game’s wild. Whenever she appears, she expands to turn the whole of the reel wild. I Am The Law comes with 2 bonus features. Bonus feature – this round is triggered by landing the sheriff’s badge bonus symbol on reels 1 and 5 on the same spin. You’ll then be offered some target practice. Take aim at the 6 bottles to reveal cash prizes. Free Spins feature – land the wanted poster on reels 1, 3 and 5 on the same spin to trigger the second feature. On offer here are 10 free spins. A new symbol, the outlaw, joins the action here. He awards 2, 14 or 40 times your stake per payline. Land an outlaw and sheriff on the same free spin and the outlaw is ‘collected’. At the end of the free spins, each ‘collected’ outlaw awards a payout of 4 times your stake. This western adventure is an enjoyable one. The cartoon style visuals are impressively done and the backing track is superb. The features don’t offer anything spectacularly original but the collection element to the free spins adds another layer of interest. Both the free spins and the pick round come along fairly regularly. The overall variance is in the medium range with maximum wins of 1,000 times your stake on each spin/free spin. Add in the collected outlaws in the feature and you can pocket 1,600 times your stake on every free spin. Cowboy-themed slots are enjoying something a resurgence of later. I Am The Law is another very decent addition. If you fancy donning your virtual Stetson, then this is a pretty good place to start. I would also recommend you try NetEnt’s Dead or Alive II which offers unrivalled payouts of up to 111,111.11 times your stake in 1 of the features!